The Roger Waters Precision Bass is named for the world-famous bassist/singer/songwriter whose elegant grooves and infectious riffs are hallmarks of the legendary Pink Floyd sound and an acclaimed solo career that continues stronger than ever today. 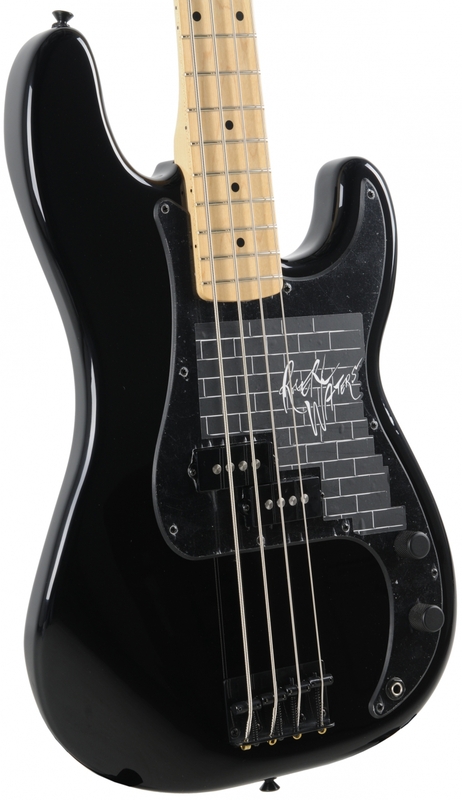 The instrument is as tastefully tailored as Waters' own simple-yet-sophisticated bass work, with distinctive features including black-on-black color scheme (black body and single-ply pickguard), Seymour Duncan® Basslines SPB-3 Quarter-Pound split-coil Precision Bass pickup, knurled black control knobs (master volume, master tone), brass nut, black bridge and strap buttons, vintage '70s-style "Fender"-stamped open-gear chrome tuners and gasketed "F"-stamped neck plate. Other features are a maple neck with vintage-style truss rod and slotted truss rod nut, 9.5"-radius maple fingerboard with 20 medium jumbo frets, gloss urethane finish (body and neck) and deluxe gig bag.